Jeremy Andrews didn’t want to give the 12 groomsmen standing up with him at his 2015 wedding the standard gifts – money clips or flasks. Instead, he gave each of them an axe which they used for a post-wedding axe-throwing party. Unbeknownst to any of those participants at the time, that party would serve as the launching pad for a business venture Andrews started this past spring in the backyard of his Battle Creek home with his wife, Erin’s, blessing. He studied the art of axe-throwing while also figuring out how many people he would need to pay the cost of the wood that would be destroyed by the axes. The initial group of axe-throwers met at his home and began taking aim at the first target after Memorial Day. Jeremy Andrews with an axe used in axe throwing competition.In many ways axe-throwing is like sports such as golf, running, or swimming where the participants are ultimately playing against themselves instead of others. Andrews says he finds it to be very meditative because the concentration involved forces you to block out external distractions and focus on your aim and the target. “It really clears your mind,” he says. This past Fall, the axe-throwing venture became an established business venture under the moniker BTL AXE, with participants and regularly scheduled gatherings. In addition, the private axe-throwing club also became a member of the World Axe Throwing League which has a worldwide membership base, including groups from Canada, Poland, and Turkey. Mario Zelaya, WATL Chairman and Founder, says he wanted to create a forum for axe throwing clubs and facilities to better communicate about the standardization of official rules and regulations to reach a level of harmony and legitimize indoor axe throwing as a sport. On Dec. 15, WATL is hosting an axe-throwing tournament in Chicago. “That way, by working together, we could put axe throwing on par with other major sports,” Zelaya says on the WATL website. Andrews says there are strict protocols and rules that BTL AXE participants follow. BTL AXE’s Fall league had 22 members. The second league now pays $160 each to get together once a week for eight weeks to throw axes. Andrews says a winter league will start Jan. 24 with a total of 44 participants. He says he already has 25 people signed up. The league is open to anyone 18 years of age or older. It will run in an eight weeks on, six weeks off format. In the future, Andrews says BTL AXE will offer clinics and one-on-one coaching. But, he also has visions of creating a family-friendly entertainment venue which will include space for axe throwing as well as other activities for adults and children. Andrews says he already has investors lined up and is looking at locating the venue close to the downtown district or in an area of town that is open to the idea and ready to make it a reality. 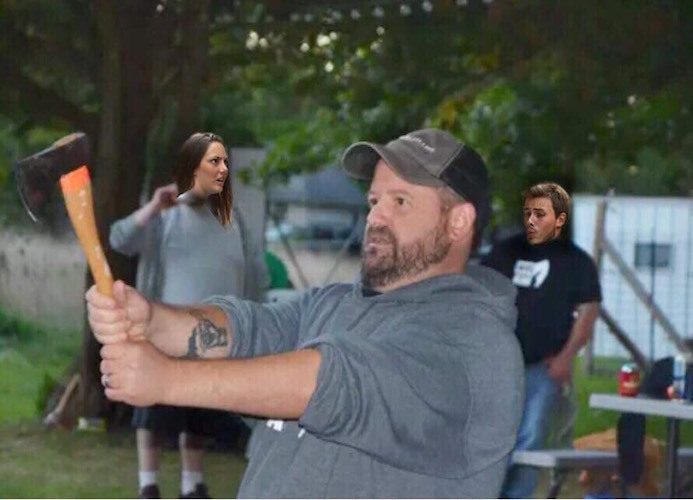 In the Fall, Andrews tested the waters holding a corporate axe throwing event for Territorial Brewing and its employees. “It will be a place where people can meet and have beer and pizza and adults will have a fenced-in, caged area where they can do axe throwing, archery, and plate-smashing,” Andrews says of the future venue. “These are fun ways to get some aggression out. To me, it’s like really good self-care. For more information about BTL Axe, visit their Facebook page or their website here. Read more articles by Jane Simons. Jane Simons is a freelance reporter and writer with more than 20 years of experience and also is the owner of In So Many Words based in Battle Creek. She is the Project Editor for On the Ground Battle Creek.